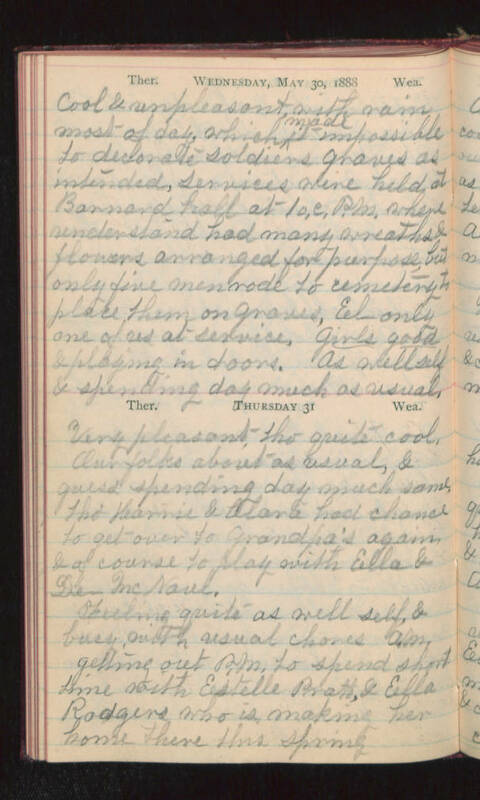 Wednesday, May 30, 1888 Cool & unpleasant with rain most of day, which made it impossible to decorate soldiers graves as intended, services were held at Barnard Hall at 1 o,c, P.M. where understand had many wreaths & flowers arranged for purpose, but only five men rode to cemetery to place them on graves, El- only one of us at service. Girls good & playing in doors. As well self & spending day much as usual. Thursday 31 Very pleasant, tho' quite cool. Our folks about as usual, & guess spending day much same, tho' Karrie & Clara had chance to get over to grandpa's again & of course to play with Ella & De- McNaul. Feeling quite as well self, & busy, with usual chores A.M. getting out P.M. to spend short time with Estelle Pratt, & Ella Rodgers who is making her home there this spring.